If the recent up-tick in global optimism about the economy persists and Europe makes some headway toward fiscal responsibility then it is likely that the risk aversion for European financial assets will subside. The best example of this risk aversion for European financial assets is the historically low interest rate on 10 Year Treasury bonds. Currently the real interest rate on 10 Year Treasury bonds is -0.10%. Over the last five years the average real interest rate has gone from 2.29% in 2007 to 0.55% in 2011. It is reasonable to assume that the real interest rate will go back to 2011 levels regardless of the resolution of the European financial crisis. Negative real interest rates only make sense when there is high probability of massive defaults. At the minimum we are looking at an increase in the nominal interest rate on 10 Year Treasury Bond from 1.89% to somewhere around 2.54% assuming no significant change in the inflation rate. The worst case scenario is if the resolution to the European crisis results in lower risk and the real interest rates trend closer to the 2007 levels. The 10 Year Treasury Bond would increase from 1.89% to by 4.28%. Ouch! This could blow up the mortgage market. If we follow the logic of portfolio managers the situation gets worse. To take advantage of the attractive interest rate to risk differential, portfolio managers will re-balance their portfolio quickly by selling Treasury bonds. This will put pressure on both Treasury interest rates and the Euro to dollar conversion rate. The United States could get hit with a double whammy in an election year. 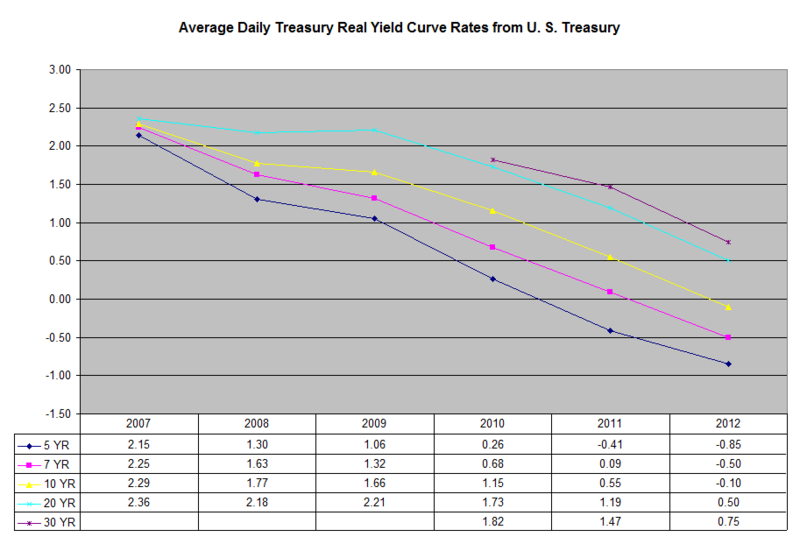 Here is a chart of the real interest rates from the Treasury Department.